Allying with enemies. Gaining intel on warlords. Tracing their networks. Striking a training camp from the skies and destroying it in a fiery explosion. You'd be forgiven for mistaking this for Afghanistan, but it's actually Middle-earth: The Shadow of Mordor, a good game with an upside-down theme. While it plays well and has interesting mechanics, Shadow of Mordor falls flat thematically because it transplants a War on Terror mentality to a fantasy world inspired by World War I. As a result, Tolkien's ideas fall victim to post-millennial cynicism and the game, while enjoyable, feels utterly wrong. 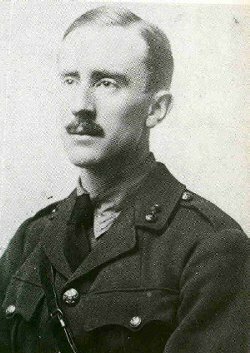 In 1916, Tolkien was in a military hospital recuperating from trench fever. He'd served on the front line at the Somme, taking part in the assaults on Schwaben Redoubt, the Leipzig Salient and Regina Trench before disease knocked him out of the war. The Somme was a nightmare. The British took 57,000 casualties on the first day alone. The lines stagnated, with troops living in squalid trenches for months, drowning in mud and gnawed by lice. Artillery bombardments made telephone lines difficult to maintain. Second Lieutenant Tolkien, as Battalion Signaling Officer, had to resort to handing written messages to runners who'd sprint them into enemy fire. "Junior officers were being killed off, a dozen a minute," Tolkien later wrote. There were 350,000 British casualties by the battle's end. Only one of Tolkien's close friends survived the war. The Somme was a watershed moment in British history, the first time the nation tasted industrial warfare. Historians still cite it as the day Victorian optimism died. And as Tolkien recuperated from his ordeal, he wrote about a fantasy realm in what he called The Book of Lost Tales. We know it today as The Silmarillion. It is perhaps not surprising, then, that World War I left an impression on the young scholar and his invented world. While scholars can dispute individual elements -- whether Sam Gamgee was inspired by Tolkien's military aides, for instance, or that Frodo shows PTSD symptoms -- the larger impact is thematic. The war made Tolkien deeply suspicious of violence, industrialization and the pursuit of power. The Lord of the Rings was a reaction to the slaughter he witnessed and the cynicism it imparted in a generation. Tolkien's heroes overcome not through new technology or savvy politics, but through their innate goodness. They fight monsters when necessary, but very few are professional soldiers, and there's always the refusal to use evil against evil. Tolkien's novels reject politics in favor of idealism. In fact, during his life Tolkien scorned the political allegories placed on his novels, stating that The One Ring was by no means the atomic bomb, that Sauron wasn't Stalin, and that Orcs were neither Nazis nor inherently evil. (He did, however, admit basing The Dead Marshes on the blasted mud of the Somme.) Tolkien wanted his books to be broadly applicable rather than representative. That's why they stay, for the most part, apolitical and broad. Which brings us to Middle-earth: The Shadow of Mordor, which is a War on Terror story if ever I've seen one. Breaking with Tolkien's novels, Shadow of Mordor injects current politics into Tolkien's largely apolitical world, filling it with the tactics, methodology and theory of counterterrorism. Consider our protagonist, Talion. As a ranger, Talion is both a career soldier and a special operator, trained to practice guerilla warfare deep in enemy territory. Driven by a need for revenge after his family dies in an unprovoked attack, Talion -- much like the early U.S. push to invade Afghanistan -- cloaks his need to punish his enemies inside otherwise clear-headed political and military objectives. And ultimately, Shadow of Mordor tells the story of him conducting a black operations campaign against Sauron, using techniques recognizable to anyone familiar with the War on Terror.